Bill's OBX Beach Life: July 4th Weekend of Beach Fun and WIND! The long July 4th weekend is the highlight of summer action on the OBX. 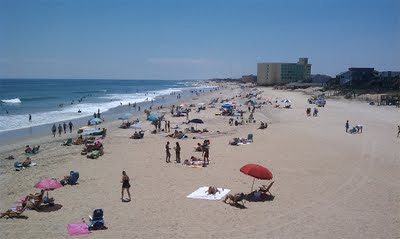 The beach is packed with visitors and the traffic is heavy with nearly every license plate showcasing an out of state tag. What a weekend for those who were/are here!! Perfect beach weather was the highlight of the weekend. Of course the inland fires did blanket parts of the islands in smoke depending upon wind direction; however, most places found sunny skies and warm water (except yesterday north of O Inlet!). 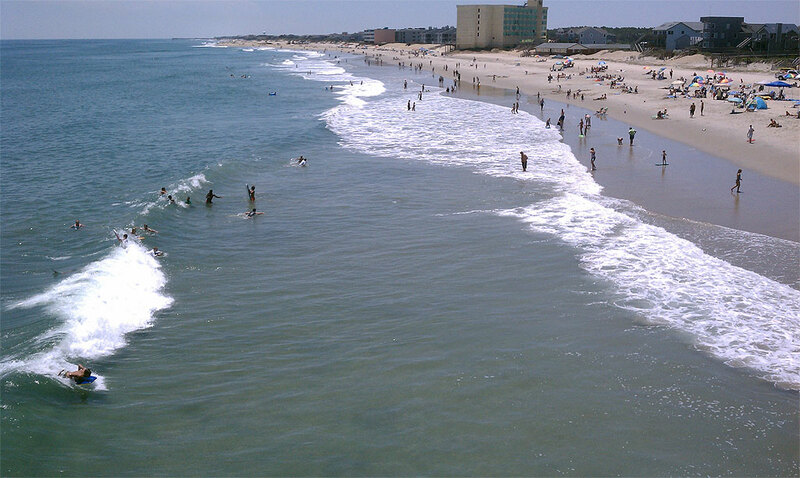 The surf size was "fun" for swimmers and general vacationers. One highlight this weekend was hitting the beach at the new Jennette's Pier. I must say, I am a critic of Nags Head's beach nourishment project; however, I must admit, the beach that has been "nourished" is quite nice! The sand is near perfect quality and the width of the new beach is very nice along with the set up in the water. Basically, the tidal zone has a very nice gradual slope making for perfect swimming and a fun boogie boarding/body surfing wave. Its simply perfect for vacationers who enjoy swimming in the ocean and frolicking in wave pool like surf! I highly recommend checking out the beach just south of the new Pier. Though as with a new beach chair, it feels great the first time on the sand, but after a year of use, the begins to fall apart. Similar with the beach nourishment project, the new sand and beach setup is simply awesome right now; but following our upcoming tropical and more damaging Fall nor'easter and winter storm seasons, hopefully that fine beach will not "rust out and fall apart." Definitely enjoy it now as it is really nice out there! In windsurfing news, the July 4th long weekend simply fired!! 30+ mph late afternoon SW winds blew across the magic spot of Waves/Rodanthe while Avon also experienced strong conditions! I caught sessions both Sunday and Monday. Sunday found small surf and fun wind at Ramp 23 just south of Salvo. I was solo out there and caught time on both the SeaLion and the Tempo. Sail size, 5.3m. Monday, was the day and Ramp 34 just north of Avon, was the call. Stronger SW wind, and a fun waist + wave was found! Occasional chest high sets rolled in and I did see one "set of the day" which offered head + peaks! Luckily, Jim M, Caleb J, and Randy, visiting from DC, all caught a wave in that set! 5.0m wind and regular wavesailing was the flavor of the day, and we had a nice crowd out there with both the local crew and a few visiting sailors. There were photos shot and if I receive some, I will post! To wrap up the July 4th weekend, Nags Head showcased a spectacular fireworks display at the Nags Head Fishing Pier. Great show, and nice to have the fireworks display back after last year's hiatus. Enjoy your wind surfing and skiing with predictwind weather forecast. Great windsurfing spot mate specially the Jennette's Pier catching fresh fish. I wish i can get overseas holiday packages to Virginia.